After New Years, BC announced that he wanted to participate in a detox with a friend of ours. I agreed to participate too, though knew I wasn't going to go all in like they were- with days of liquid only diets followed by shakes replacing meals. 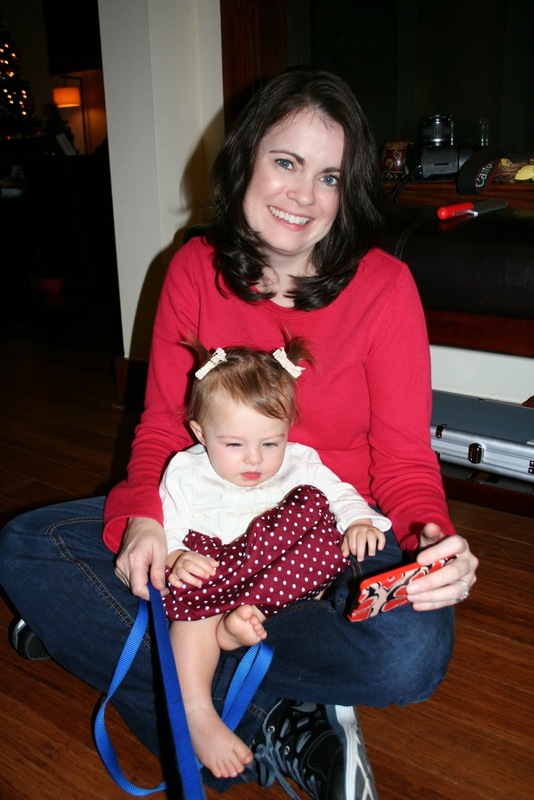 I mean, I needed my energy to take care of a busy little 14 month old (that was my excuse and I am sticking to it!). I did make an effort to eat extra healthy & cut out alcohol, though I couldn't bare the thought of parting with my morning coffee (and didn't). Fast forward to last Friday night, when I unexpectedly went through my own extreme detox. It started around 5:30pm Friday night. BC was out of town on business, and my parents were here visiting for the night. As our Chinese food arrived and we began unpacking everything, I started to feel funny. It felt like I was having a panic attack- heart racing, short of breath- something I have not experienced in many, many years- but definitely know the feeling of. I chose to just breath through it and proceeded to eat my dinner. After dinner the feelings started intensifying, so I asked my parents to keep an eye on Iyla while I 'checked a work email upstairs.' I really just needed to lie down for a moment and catch my breath, hoping my pulse would calm. Within minutes of lying down a HUGE wave of nausea overtook me, and I found myself running to the bathroom. I then proceeded to spend the next 4 hours there, with waves of sickness hitting me from (ahem) both ends roughly every 5 minutes. It was hellish, to say the least. In between the waves I was racing downstairs to help start Iyla's bottle, and texting my mom from the bathroom with further instructions on Iyla's bedtime routine. I do not know what I would have done if they wouldn't have been there! I was absolutely incapacitated and they were absolutely godsends for being able to help as they did. It was definitely an extreme detox, as today (Monday) I am still on a mostly liquid diet of water, tea, & soup. My body eradicated whatever it was invading it, and in the process 'cleansed' itself of every.single.thing inside me. Good times! Today I made a huge batch of this Green Curry Soup (adding chicken and doubling the curry paste) and it is just what the doctor ordered. So far Iyla seems fine… and I am keeping my fingers crossed that she doesn't succumb to whatever bug that was! In closing, I bring you some photos from Friday's Blizzard. And by Blizzard, I mean we got the tiniest little dusting of snow, which was enough to totally shut down the city of Austin. Pretty hilarious to this Wisconsin girl! (And it was 70 degrees again the next day. As it should be). We survived the Grand Blizzard of 2014! In the past week, Iyla has discovered that there is a whole new physical dimensional out there: that of going vertical. It all started with some blue storage tubs we had out to clean up Christmas with (yes, it was Christmas in our house until mid- January! No judging). Iyla was excited to find that she could crouch down and climb inside these tubs. Big discovery and lots of fun! She would put various toys inside the tub, then climb in and retrieve them. Later that same day, she also discovered she could crouch down and get past our dining room chairs that were strategically blocking the path to Sam's cat food. Nanny cam of Iyla playing on a dining room chair. She still can't climb onto it herself, but obviously delights in getting to view the world from a new vantage point! Her awareness of this new world then extended further into Sam's litter box, much to our dismay. Seems someone is dropping the hint she needs her own sandbox. Her dollies apparently enjoy playing in her baby potty just as much as Sam's litter box. Awesome. This vertical leap has transferred to her outdoor explorations as well. Iyla now delights in practicing walking UP and DOWN hills, and is getting pretty darn good at it! She will announce "up!" as she leans forward and swings her arms for support, then make her "whoosh" sound for down as she carefully descends. She will take our hands initially on a new or extra steep hill, then let go as she gains confidence. Iyla also climbed into our garden bed for the first time- slowly and methodically pulling herself up and beside the tomato cage. It is so cute to watch her explore- she isn't a kid who throws caution to the wind when learning a new physical feat; rather, she is caution itself personified. The most heart stopping moment of the week? I was making breakfast, and Iyla had been silent a bit too long. At one point I had heard her briefly fuss as she often does if she has pulled a book down and I am not right there to read it. Suddenly I had a Mama Bear urge to go looking for her. Not finding her anywhere downstairs, I peeked up our staircase. And there at the very top stood Iyla Grace, looking down at me with a look of pure pride. She then quickly disappeared into her room and reappeared with her 2 pacis, which are only used for sleeping. Naughty! "Oh hi Mama. Nothing to see here. Pacis!" We now have a baby gate at the base of the stairs, and are on heightened alert at all times. Thankfully Iyla is still pretty slow and meticulous with her new skills, though I am quite sure there are bound to be many more adventures leading to parental heart attacks. 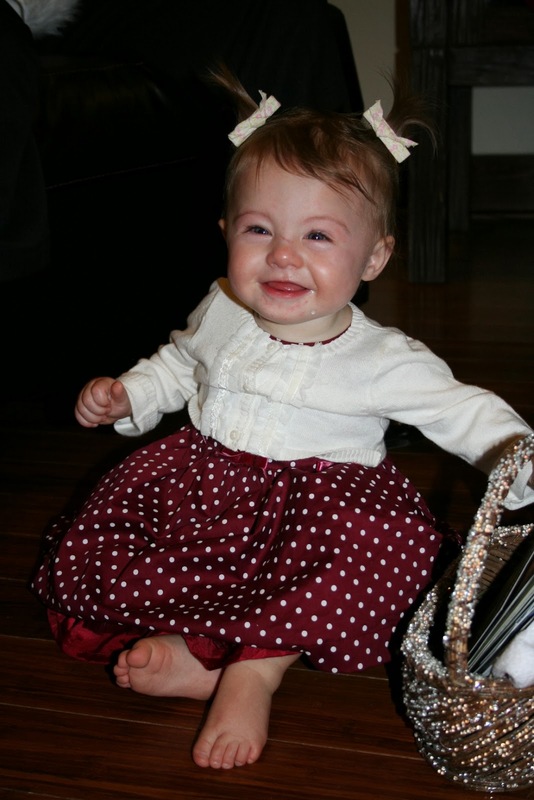 Sweet Iyla Grace, today you are 14 months old! It has been a BIG month for you- as you are now officially a walker, talking away & exploring everything around you. You are still such a good, careful, cautious, sweet, deliberate kiddo…. I totally trust you walking around out of sight, as I'll usually find you just looking up at the Christmas tree, playing with your dollies, or walking circles through the house. It is actually easier now that you are mobile, as you can go wherever you want all by yourself! You were never a big crawler, so this has been an awesome milestone for you. Here are your 14 month updates! How big? Here you are next to Sam! Sleep? You are such a good sleeper! You take 2 naps a day, usually about 60-90 minutes each, and sleep from around 7:30pm straight through to 7:15am or so. Eating? Another big milestone this past month was that we officially weaned you from breastfeeding. You now happily take 4 bottles of milk a day- in the morning, before each nap, and at bedtime. I put a little breast milk from a mini pump session in a bottle for you, and you flat out pushed it away- wanting your whole cow's milk ONLY. You have adapted well! You are also an excellent eater. You devour your scrambled eggs every morning (which I make with onions, cilantro, lots of spinach, & a little cheese). You love chicken, fish, shrimp (if we serve you shrimp you will NOT eat anything else- you love it so much), broccoli, carrots, sweet potatoes, and cauliflower. I love the curls that are starting to come in! You know where we keep your bibs and will go fetch one when asked, delighting in bringing it back to the table for meal time. Such a smart girl! Potty time? Now that you can walk, you can also stand up from your potty all by yourself- which has made things a bit more challenging. I moved your potty from your room into your bathroom and just that change has really helped. You still usually do #1 and #2 every morning and if you have to go when sat on the potty, will go. Teeth? Still absolutely NO signs of any! Words? This month you started saying "Mama" and "Dada" purposefully, and absolutely know those words go with BC and I. It melts our hearts! Some other words you consistently say: kitty, keys, baby (day-dee… you exclaim this every time you see a picture of a baby or when you pick up your doll! ), Mama, Dada, Iyla (eye-ya), Mimi (when you see the picture of Mimi on our fridge), please, quack, duck, snack, cheese, walk ('gauk'), up (said constantly as you tug on my pants! ), Lily, & Lee. You love signing milk, book, all done and more, and will pant whenever you see a dog. *Walking. As per the norm for you, once you were really confident and ready, you just broke out the walking like an expert. No real toddling around, just full out walking wherever you pleased, often carrying random items with you. We've been appreciating the open park space right down the alley from our house! *Following directions! We can ask you to go get something from another room, like your water bottle or dolly, and we always know when you find it because we hear you exclaim "AH!" You understand so much. *You are definitely going through some attachment and separation anxiety right now. Whenever a new adult comes over you typically cling to me and cry hard for a couple of minutes before warming up. You still absolutely need your own space and time with people… and need to be given the freedom to approach others on your own terms. The exception? Other kids. You LOVE any and all kids and will go to them immediately. Our little social butterfly! We had just finished reading that pile of around 20 books, and you could have kept going! You saw your friend Harper for the first time since you were both 3 months old! So fun to see how much you've both grown. You also play with your buddy Henley several times a week. He is only 1 day younger than you! I'm so grateful his family lives right in our neighborhood, and have become good friends with his Mama Irene. Not happy about cousin Miles trying to hold you down for a photo. The expressions in this photo are priceless! *Patience. Especially when I am cooking! *BC and I have been doing a cleanse and taking a couple of weeks to eat extra healthy. It has definitely made a difference already, and I am now again below my pre pregnancy weight. *My chest has deflated a bit with the weaning, though this past month I had some fullness and discomfort as everything adjusted. Weaning was definitely a bit sad, though liberating at the same time. *'Knocking on wood'- my Mommy Thumb has been GREAT since the last steroid injection! It definitely helps that I am picking you up less now that you are mobile. *I've been doing 30-40 minutes of yoga in the evenings while you play with Papa, and it's felt great to get back into an exercise routine. We love you so much sweet girl, and are delighting in every step of your journey! Iyla sitting pretty with her Nutcracker friends. This girl cannot read enough! Costume change post nap- time to open presents! Christmas Eve Day was absolutely gorgeous! Christmas morning! This kid slept until almost 7:30- too bad I was up at 5:45. Iyla's big present this year! 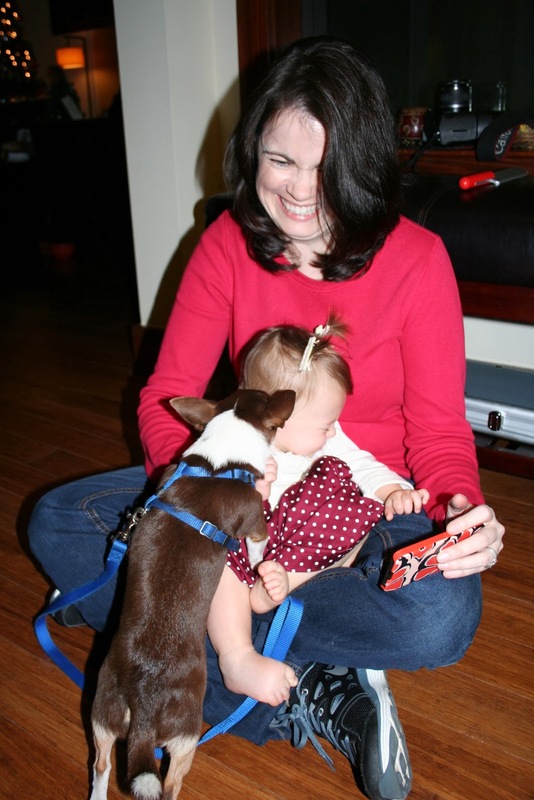 And tried to use my brother's dog as bait for her to stay on Santa's lap…. 'Really? That's all it does?' Tough crowd. This shot is way cropped because…. No one told me you could see almost all the way up my leg! Geez. Iyla had so much fun! It was a fun filled whirlwind, and we had a blast celebrating with everyone!